The PortServer TS 2/4 family delivers simple, reliable and cost-effective network connectivity for multiple serial devices. It addresses the growing need to connect individual devices to the network over industry standard Ethernet in many applications - including retail/point-of-sale, building control and medical point-of-care. 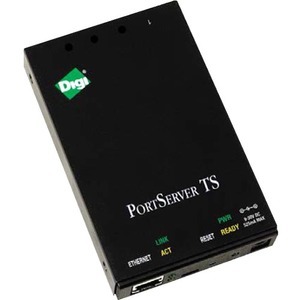 Part of Digi's broad device server offering, PortServer TS 2/4 delivers standard serial-to-Ethernet connectivity and is ideal for applications requiring COM ports, serial tunneling, or where TCP Socket, UDP Socket, or UDP Multicast functionality is needed. Digi's patented RealPort technology delivers the industry's most robust, reliable and versatile COM port control and management. RealPort makes it possible to establish a connection between the host and networked serial device by creating a local COM or TTY port on the host computer, allowing software applications to work with networked device servers instead of requiring a host adapter.